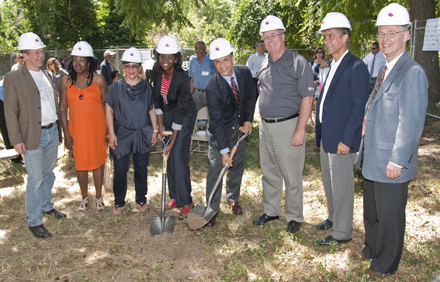 Empowerhouse Breaks Ground in D.C. Representatives from Parsons The New School for Design, Stevens Institute of Technology, Habitat for Humanity, and the local government came together to break ground on a solar-powered home in Deanwood. Photo by Lisa Bleich. On June 29, Empowerhouse, a team of students from Parsons The New School for Design, the Milano School of International Affairs, Management and Urban Policy at The New School, and Stevens Institute of Technology competing in the U.S. Department of Energy Solar Decathlon, broke ground on a solar-powered, two-family home for residents of D.C.’s Deanwood neighborhood. Parsons Executive Dean Joel Towers, Milano Dean Neil Grabois, and Parsons Board Chair Sheila Johnson, joined Washington D.C. Deputy Mayor Victor Hoskins and leadership from Habitat for Humanity of Washington D.C. (D.C. Habitat) and other local officials, donned hard hats to break ground on the home, which will eventually house two Deanwood families. Members of the local community gathered to celebrate the occasion and to see renderings and models of the house’s design, which the Empowerhouse team has been developing and refining since they were accepted into the Solar Decathlon competition last year. The Solar Decathlon is an international competition in which collegiate teams design, build, and operate solar-powered houses on the National Mall. The Empowerhouse team is taking the competition a step further by creating a house for the local DC community, working in partnership with D.C. Habitat and the D.C. Department of Housing and Community Development (DHCD). Empowerhouse will be a new model for affordable, green housing in the district. The project is the first Passive House in D.C., today’s highest energy standard, and will consume up to 90 percent less energy than a typical home. To keep up with the team’s progress, visit the Empowerhouse website.